Rossie glows in the dark with new UV Sports initiative! Rossie has linked with local sport charity, Skilz Academy. This unique partnership brings excitement, joy and more opportunities for our young people. Skilz Academy is a Scottish sports charity which provides all kinds of sport sessions and coaching to children and young people. Skilz Academy officially became a charity in 2017 and continues to grow and provide programmes including ‘UV Sports’ and ‘Street Football’, while investing in and building the confidence and employability of their volunteers. ‘UV Sports’ is a new initiative which has encouraged many children and young people in schools and youth clubs to take part in sports. During sessions, the UV clothing is clearly visible, while faces and bodies are not. 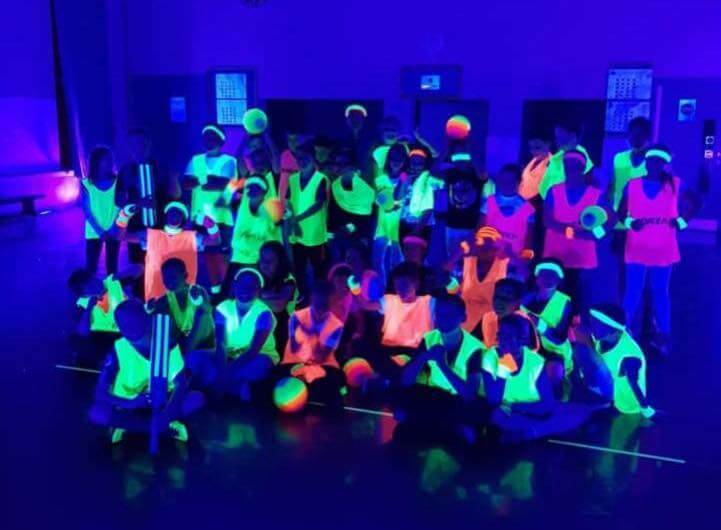 An excellent idea which takes inclusion to a whole new level, the unique ‘Sport in the Dark’ UV light sessions have been a huge success with our staff and young people. Some young people may have low self-esteem, making it a challenge for them to feel confident in taking part in sports. These sessions aim to break these barriers and to help our young people experience the health and wellbeing benefits that taking part in sports brings. As part of this partnership, our First Aid trainer will provide members of Skilz Academy with First Aid training. Physical Education teacher and First Aid trainer at Rossie, Joe, thanks the Skilz Academy team. He says he “can’t wait for more with our exciting new partnership to help encourage our young people to lead active lifestyle to improve health and wellbeing”. Next PostYoung People of Rossie Take to the Stage at the Christmas Extravaganza!